The Rock Islands of Palau are pure limestone and are are the remains of ancient coral reefs which were lifted up out of the ocean millions of years ago by volcanic forces. Palau rests on top of an undersea ridge of volcanic mountains, part of the "Pacific Ring of Fire" known for its undersea activity. One of the deepest trenches in the ocean is just east of Palau (Marianas Trench) which is about 27,000 feet deep. Locally called "Chelbacheb", the magnificent Rock Islands and the scuba diving areas around them have made Palau famous throughout the world. 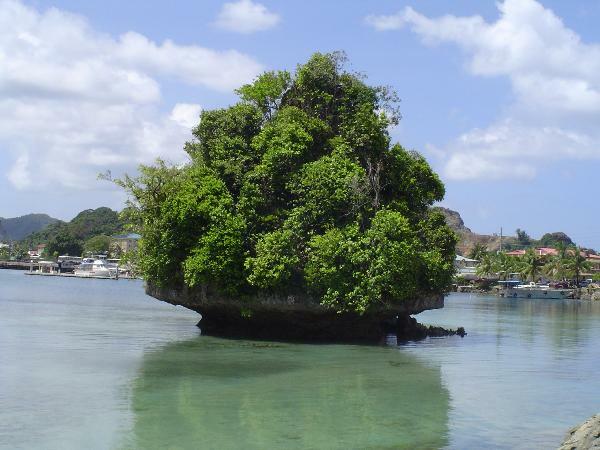 The Rock Islands are spread out over more than 23 miles between the islands of Koror and Peleliu. The islands are heavily undercut, giving them the appearance of green mushrooms. Rainfall passes through leaves and humus, picking up acidity which accelerates the erosion of the island's structure. At water level, the undercutting nature of the sea's erosion is evident. It is easy to see how the combined erosive effects of sea, rain and acidity erode the soft limestone islands at sea level. Sea urchins and limpets are embedded into the rock, eating algae in slow, but constant process, adding to the erosion. No need for a boat or special equipment to claim this cache. At ground zero you will be standing near the pictured rock island in the harbor of Koror. 1. Have your picture taken in front of the rock island nearest GZ and post it in your log. 2. Estimate the amount of the undercut on the rock island at GZ and send your estimation to us via e-mail. Don't wait to log your find, attach the picture to your log and send the e-mail. If there is a problem with your findings we will contact you. All logs without a posted picture or e-mail will be deleted to comply with the EarthCaching requirements.